WATCHBUDDY WATCHES are the World's Most Lovable Theme Watches, they combine beauty, style and grace with functionality. Our WATCHBUDDY ELITE watch model has a clean, ultra-sleek Scandinavian-Danish design. A precision quartz crystal movement with three hands - hour, minute and second. The watch case is Silver-Tone, Chrome-Plated Metal Alloy. The case back is stainless steel. The strap (or band) is made of fine wire mesh with a metal buckle closure and is therefore easily adjustable and resistant to damage / degradation from wrist perspiration. Battery life is 2 years. Watches have a one year limited warranty. Watches come in two sizes - Large for Men & Big Boned Women and - Small for Standard Size Women and Older Children (13 year and above). 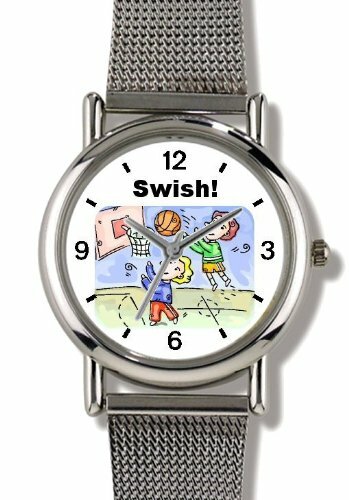 Each WatchBuddy theme product is carefully designed & crafted and then graced with an image of world class fine art (paintings & drawings); fine photographic art; charming, endearing or humorous realistic art or whimsical cartoon art; or iconic designs & symbols. Our vast library of images encompasses almost every theme and subject imaginable! These watches are a unique and perfect gift idea or present for all occasions such as a Birthday, Anniversary, Mother's Day, Father's Day, Valentine's Day, Graduation, Bar Mitzvah, Bat Mitzvah, Christmas or Hanukkah.